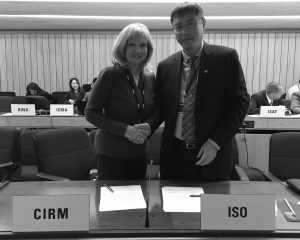 Non governmental organizations CIRM (established in 1928) and the International Organization for Standardization (established in 1947), have today signed a Memorandum of Understanding to bring forward closer opportunities for collaboration in the development of standards and related activities. Both organizations are working in the field of maritime communications, maritime safety and efficiency of navigation. Respective and complimentary objectives can be achieved with maximum coordination of efforts and it is envisaged that common interest subjects, programmes and activities will be enhanced with this collaboration.